In 1823 William and Amanda Ferry opened a boarding school for Métis children on Mackinac Island, Michigan Territory, setting in motion an intense spiritual battle to win the souls and change the lives of the children, their parents, and all others living at Mackinac. Battle for the Soul demonstrates how a group of enthusiastic missionaries, empowered by an uncompromising religious motivation, served as agents of Americanization. The Ferrys' high hopes crumbled, however, as they watched their work bring about a revival of Catholicism and their students refuse to abandon the fur trade as a way of life. The story of the Mackinaw Mission is that of people who held differing world views negotiating to create a "middle-ground," a society with room for all. Widder's study is a welcome addition to the literature on American frontier missions. Using Richard White's "middle ground" paradigm, it focuses on the cultural interaction between French, British, American, and various native groups at the Mackinac mission in Michigan during the early 19th century. The author draws on materials from the American Board of Commissioners for Foreign Missions archives, as well as other manuscript sources, to trace not only the missionaries' efforts to Christianize and Americanize the native peoples, but the religious, social, and cultural conflicts between Protestant missionaries and Catholic priests in the region. Much attention has been given to the missionaries to the Indians in other areas of the US, but little to this region. Keith R. Widder served as Curator of History, Mackinac Island State Park Commission for over 25 years. He has written extensively on the history of the western Great Lakes and is author of Battle for the Soul: Metis Children Encounter Evangelical Protestants at Mackinaw Mission, 1823-1837. "In the 1830s evangelical missionaries, confident of their ability to transform the world, encountered the Mtis of the upper Great Lakes . . . Battle for the Soul chronicles their fascinating contact as missionaries attempted to transform the Mtis through their children. Fair, sensitive, and nuanced, this is a history that never seeks to demonize and always seeks to understand." 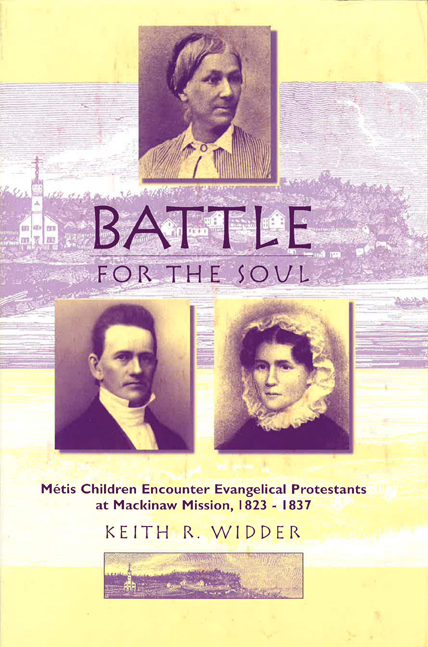 "Keith Widder has given us a thoughtful and carefully researched account of the impact of evangelical Protestantism on the Native Americans and their Mtis relatives at the Mackinaw Mission in the 1820s and 1830s. . . . this seminal work adds greatly to our understanding of the history of the Western Great Lakes".